It is nice to hear from those of you who jones for the Adirondacks that you enjoy the photos on this Adirondack Lifestyle blog. Today's picture was taken from the front deck this morning. What you can't see is that is 17 below zero. I think I have done a commendable job of refraining from raving about skiing recently. So I am due. Get used to it as today marks the beginning of my ode to Adirondack Spring Skiing. We only have a few months left for me to indulge in discussing my favorite topic; skiing. We received over 12 inches of fresh snow in the last storm a few days ago, and more is on the way. I was at Whiteface Mountain the other day and it is in great condition. I was able to ski fresh, Adirondack uncut powder with the assistance of a lift! 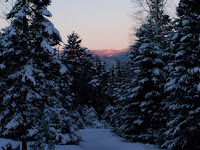 The Adirondack backcountry skiing is outstanding these days as we have a great base and tons of fresh snow on top. If you like to earn your turns, this would be a good weekend to ski the trees in the Adirondacks. Naturally, I am intimately familiar with the cross-country conditions at Mount Van Hooevenberg, since I ski there most every day. The cross-country trails are in excellent shape and the skiing is superb. Skiing's great in New York State - especially in the Adirondacks! !